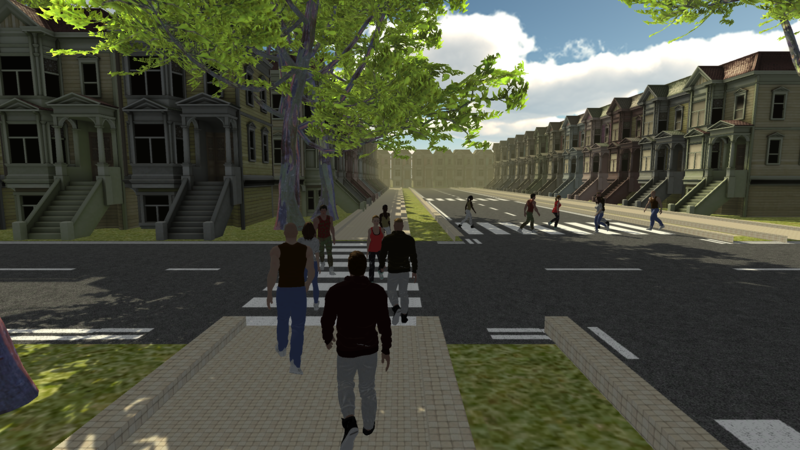 In the demo, we use ML-Agents to model a crowded environment in which agents navigate a simulated scenario containing realistic 3D models of obstacles and objects. Each agent is provided with a neural-network brain, which has been trained using the Proximal Policy Optimization Reinforcement Learning algorithm provided by Unity. During the training phase, a reward system is used to allow agents to learn how reach their goal, simultaneously avoiding collisions with other people and objects, in a similar fashion to the Social Force model. The training phase has been done in a Curriculum-fashioned way, increasing from time to time the number of agents in the scene, as well as the agents' speed and possible moving directions. The training took 5500000 iterations (<6 hours) for each brain in order to avoid collisions with other agents. which do not exploit machine learning techniques, but are based on hard-coded rules. max_steps = 5e10 ##5e5 # Set maximum number of steps to run environment. env_name = "ObstacleCurriculum" # Name of the training environment file. gamma = 0.99 #0.99 # Reward discount rate. lambd = 0.95 ##0.95 # Lambda parameter for GAE. time_horizon = 2048 ##2048 # How many steps to collect per agent before adding to buffer. num_epoch = 5 ##5 # Number of gradient descent steps per batch of experiences. num_layers = 2 ##2 # Number of hidden layers between state/observation encoding and value/policy layers. epsilon = 0.2 ##0.2 # Acceptable threshold around ratio of old and new policy probabilities. buffer_size = 4096 ##2048 # How large the experience buffer should be before gradient descent. hidden_units = 128 ##64 # Number of units in hidden layer. batch_size = 32 ##64 # How many experiences per gradient descent update step. The modeling of an advanced camera model, which can reproduce a variety of features, such as zoom, focal length, PTZ movement, chromatic aberration, lens distortion and sensor noise. By integrating OpenCV code in Unity, we are thus able to track each person's movement in the scene. This demo shows how easy can be to train a brain in Unity using ML-Agents to model a simple crowd behaviour. However, this method does not model a proper human behavioural model, because it relies on a fully unsupervised learning. The obtained crowd flow is not an exact representation of a realistic crowd environment. Nonetheless, agents in the scene move in a pedestrian-like fashion, avoiding each other and obstacles, as according to the social zones.